JWe offer bulls for sale private treaty twice a year – November and March. Yearling and 18 month old virgin bulls are available. Our bull catalog will be available to download through this website in October and January. If you would like to be put on the mailing list to receive our bull catalog by mail, please feel free to call us at 1.406.266.4121 or send us an email through our contact form. Breeding Guarantee: all bulls selling against injury that keeps the bull(s) from being a breeder for the first breeding season. Breeding season is defined as the 90 day period following the first time the bull(s) are turned out. If a replacement bull is available, he will be provided, or if a buyer prefers, credit toward a bull will be given in the following year’s sale, less salvage value of the injured bull. Younger Schatzee son whose dam came from Marshall Ernst. 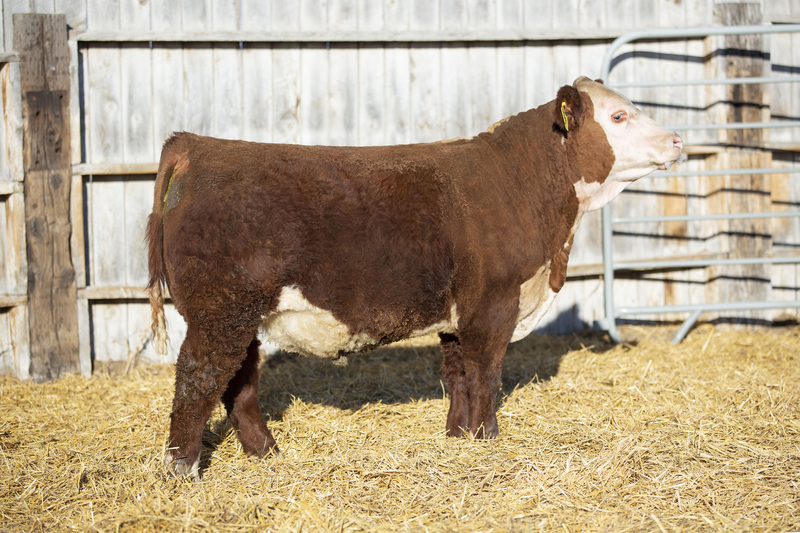 F79 shows off all the attributes of his sire – big hip, good depth of rib and dimension. F79 will add lbs and brings udder quality to the forefront. Possibly our best 4140B son to date. F89 has great overall depth, dimension and muscle expression and nicely pigmented. Even though F89 is one of the younger bulls, he posted one of the heavier weaning weights. Really good bull here. Sign up for a our newsletter to receive sale catalogs, sale videos and ranch event updates straight to your inbox. © 2019 Ehlke Herefords. All Rights Reserved.